Take a really close look at the inside of your eye. The inside of your eye is one thing you’re guaranteed never to get a good look at. Even if you could, the pupil is far too small an aperture to allow you to see the entire interior. University of Michigan ophthalmologic photographer Richard Hackel compares the problem to taking a picture of a room through a keyhole. To overcome this hurdle, Hackel uses a computer program to stitch together images taken from 20 different angles by a special digital camera. The result is an unusual, fully detailed map of the inside of a healthy 26-year-old’s eye. The inside of the eye derives its orange color from a layer of pigment cells inside the retina. This layer of pigment—just one cell thick—absorbs light coming in and prevents it from scattering. The result is a crisper view. How much pigment a person has is variable and is determined mostly by genetics. Optometrists call lightly colored retinas “blondes,” but the blondest retinas belong to vision-poor albinos, who have no pigment in their retinas at all. Sitting just above the pigment layer toward the eye’s interior are light-sensitive rod cells and color-sensitive cone cells. Molecules in these cells change shape when light hits them. The change is translated into an electrochemical signal that is picked up by nerve cells, which relay it to the brain. While most rods are evenly dispersed throughout the retina, all of an eye’s 6 million or so color-sensitive cones are concentrated in a 1/7-inch bull’s-eye of color vision—the macula. The speck in the center of the bull’s-eye is the fovea, which is so cone-dense that it creates a dip in the otherwise smooth retinal surface. About 30,000 cones are clustered here, more than anywhere else in the eye. Cone cells work hard, and when their waste products build up faster than the body can clear them, tiny yellow spots can form around the fovea. As a person ages, these plaques, along with leaky blood vessels, tend to interrupt normal rod and cone functioning. Known as macular degeneration, this is the leading cause of vision loss and blindness in older Americans. 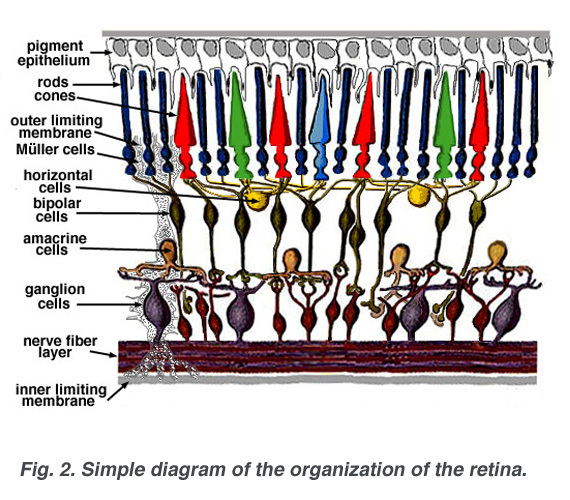 A layer of nerve cells coats the innermost surface of the retina. All nerve paths meet at the optic nerve—the large white spot—which transmits data to the brain at a rate of 10 megabits per second. That’s about as fast as a computer Ethernet cable. The optic nerve, technically considered brain matter, is the only part of the central nervous system that can be photographed directly. But the lack of light-sensitive rods where it meets the retina creates a blind spot. 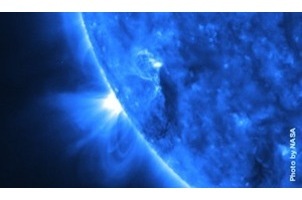 Q&BA: What happens if you are exposed to the vacuum of space?